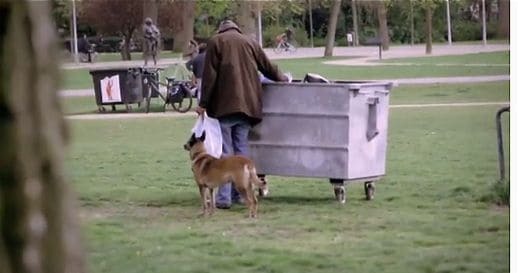 Many people visiting Amsterdam are surprised to see there are not many homeless people in the streets. In many European countries, there are many homeless people in the streets. In The Netherlands, the social system should prevent people from becoming homeless, but still the amount of homeless in Holland are on the rise. Winters in Amsterdam are very cold. In the winter of 2018-2019, Amsterdam offers a shelter for all homeless when it gets really cold. Here are 10 most asked question about homeless people in Amsterdam. 1. How many homeless people are there in Amsterdam? According to estimates from the council, about 200 people sleep in the streets in Amsterdam every day (total inhabitants is 800.000) everyday. Is this a lot? It’s difficult to tell, because countries have different ways of counting their homeless. Besides that, it’s obviously rather difficult to count homeless, as they are not registered. In Belgian Antwerp (510.000 inhabitants), they count 500 homeless. 2. Does the Dutch government give financial help to homeless people? All people with Dutch residency who have no income nor property are entitled to social welfare payment (In Dutch ‘bijstandsuitkering’ or WWB). The basic payment (single, no kids, no income, no property) is € 679,75 per month. When you are homeless, the process to apply for social benefits is more complicated, but doable. 3. Where can homeless people in Holland find shelter? City councils are responsible for the homeless people in their own municipality. The Dutch national government awards social funding to each city council. The council can spend these funds as they see fit. In large cities, like Amsterdam and Rotterdam, there are daycare facilities (dagopvang) and nightcare shelters (nachtopvang) for the homeless. Then there is a wide variety of private shelters, such as the Salvation Army (Leger des Heils). Most are free or cheap. 4. I don’t have a Dutch residency, can I stay in a homeless shelter in Amsterdam? In The Netherlands there exists an extensive social system (high taxes pay for extended social services). This also means, that if you don’t have residence permit for The Netherlands, you will not receive support. Until 2015, people without a residence card are not allowed to stay in an Amsterdam shelter. Some civil society organisations do accommodate homeless people without papers, under conditions. As a rule, shelters in Amsterdam only take in people who have been in the city for a longer period (3 months). If you have just arrived you are supposed to arrange their own accommodation. In any case, expect a screening and a waiting list. People with serious psychological disorders and children do tend to get help from Dutch authorities. For women (with or without papers) who have been a victim of domestic or sexual violence can find accommodation in a Women’s shelter. As of 1 January 2015, Dutch city councils are no longer allowed to refuse undocumented people. There is a map of private and publicly funded shelters in Amsterdam. 5. Why are there not many homeless people in the streets in Amsterdam? If you walk out of any train station in European cities like Madrid, Paris or London, the streets are filled with homeless people, beggers, junkies and alcoholics. In Amsterdam, you will hardly find any. The reason is a new policy that the 4 largest cities in The Netherlands (Amsterdam, Rotterdam, Den Haag and Utrecht) and the Dutch government implemented in 2006 to get homeless people off the streets. In the first phase of the project, from 2006 – 2010, over 10.000 people who were living in the streets were offered personal assistance in finding medical care, tackle addictions and treat psychological problems. All those who took the offer, got free accommodation. Over 5.500 people found a more stable lifestyle with an income and a roof over their heads. The results were noticeable. In october 2008, the streets of the 4 large cities had lost 6.500 homeless people. Classic urban sights such as drug users, screaming homeless with heavy psychiatric disorders, beggars, petty thieves, homeless prostitutes, all once a common sight in Amsterdam, had more or less disappeared from the Amsterdam view. The project cost €175 million. It was calculated each invested euro saved 2-3 euros. 6. So there are no more homeless people in Amsterdam? There are still many homeless people in Amsterdam and their numbers are growing. In 2013 there were an estimated 60.550 people homeless in Holland, 10% more than in 2010. The government and other groups help the homeless to find housing, but more and more there is no more social housing available. 7. Are you allowed to sleep in the streets in Amsterdam? No, it’s not allowed to sleep outside in Amsterdam (nor in your car). If you sleep on a park bench, the police can arrest you. You will be spending the night in jail. It’s not likely the police will actually arrest you, unless you cause disturbance. 8. Home many young people are homeless in The Netherlands? Between 8000 and 9000 young people are homeless (2014) in The Netherlands. Most are between 14 and 23. Youngsters under the age of 18 you will not likely find sleeping in the streets of Amsterdam because they wil be taken into the care of Bureau Jeugdzorg. 9. Where can homeless people in Amsterdam sleep in winter? In winter time the winter shelter opens for homeless people from Amsterdam. The Amsterdam city council is responsible for providing accommodation to its citizens. Asylumseekers can ask for support at the Vreemdelingenpolitie at Central Station. In winter 2018 – 2019 there are two winter shelters in Amsterdam open from 1 december 2018 til 1 april 2019. If you have no place to sleep, you can report at Jan van Galenstraat 323, entrance B between 14.00 and 16.00 Monday, Tuesday, Thursday and Friday. The GGD will interview you and determine whether you can sleep at the homeless shelter. There you will get a bed, a shower, a hot meal and breakfast. The shelter is only for the evenings and nights. 10. Where can you sleep when it is really cold in Amsterdam? People from other countries, who have no residence permits are generally refused to stay at a Municipal homeless shelter. However, when it get really cold in Amsterdam in winter, there is a special situation and everybody who doesn’t have roof can find shelter in the winter shelters. The police will also actively search for homeless people to take them to the shelter. In thi article yyu havent stated exactly where the shelters can be found. Adresses and contact numbers etc. You have highlighted some red tape but have left out the most vital information. WHERE IS THE SHELTER ? How do we contact them? Valeriusplein 9. Just East of Vondelpark. I will like to have feedkack urgently because the facilities at Valeriusplein 9 are closed. If someone is in need where this facilities are relocated. And the phone number is the same? 020 – 488 1151 between 10:00 – 11 uur and 18:30-19-30 uur to reserve a bed? These facilities are only open in wintertime. Hello. My name is Jim. I am Greek and i live in the Netherlands the last 5 months. I used to work at a Greek restaurant in Limburg but he through me out of the job and from the room he used to give me. Now i stay at a acquainted’s house in Middelburg, but i can’t stay here anymore. I’ll be homeless from the next week for my first time in my live. I try to find a job but i need a place to stay for a sort period. If you can help me please contact me by email (dimitris.mirgiotis@outlook.com) or by phone (0682601644) immediately. Doable to get welfare if you’re homeless? Chexk your facts ! Is not true that the government helps every citizen who is homeless. This help does not apply for entrepreneurs who due to crisis have lost their homes. Im an entrepreneur, im still trying to keep my little business running because I need to survive, I also work part time in a restaurant but I cant afford to rent a room a place, if I ask the government for help I always get the same answer, there is no help for people who holds a business registered at the Kvk (Chamber of Commerce), so basically they only help people with no house with no job etc..in this country if you want to fight to progress, not to be a burden all the way for the government, you get absolutely no support. Hi,I have a friend that is from Romania is a bit handicap and live for 7 years in Amsterdam with some friends,before one year they put him out . but because his not apply to some letters he go to court and they ask back the money and also unregistered for the city and put him out for the shelter. That is really crazy,the guy is Hive and really sick and now live in the street.. If someone can help with everything or to give Advice to what have to do I will be grateful..